This is veterinary course structured for canine trainers and those who are planning to study canine Neuroanatomy, ethology, or animal science. London school of veterinary medicine staff teaches this course. Basic medical management is an introductory course for students of all canine relationships and areas. The program teaches students the inception of vaccinations, nutrition fundamentals, welfare, required grooming, and emergency techniques regarding bloat and torsion, pancreatitis, basic injuries, and dental issues. This course is a neurobiology formation class that instructs the biological science behind a canine’s capability to detect scent. The course is not elementary. It is a functional anatomy class with a biology overview and includes airflow dynamics and laminar flow principals. The student will learn the precise method which a canine processes an odor from gas to odor sensory neuron with a strong focus on organic detection neurons. This course introduces the students to the physiology and neurobiology of the canine auditory system. Microsmatic species have highly developed auditory pathways, as genetically reciprocal to the olfactory pathways. This course allows the student to explore and understand the hearing capability, as relating to the species and survival. This class is accompanied by a first rate veterinary manual, designed specifically for working dog teams and trainers in the aspects of dealing with situations of acute medical need. The class is designed as a survey of treatment, utilizing the manual as the basis for the survey. This science course is a prerequisite for behavioral neurobiology I. This course teaches the student the basic neurobiology systems: sensory to memory to muscle reaction pathways. The course focuses strongly focuses on the areas of the brain responsible for fear and aggression, memory, and autonomic nervous reactions. The London Hanover University veterinary medical instructors instruct this course. It teaches the emergency skills and life saving procedures for canines serving in the field. The course covers trauma, emergency surgical processes, as well as general medical procedures, the program covers equipment and techniques; including modification from the environment. This biology course allows the student to carefully follow the biological events, cellular to macro, of the breakdown and decomposition of human body components. The course considers two views: internal, biological events and external gas expression. This is a biology course based upon both the endocrine system and volatile organic compounds: The class investigates the organs and biological components that render what another animal regards as a scent. The class teaches the student both the sources of scent and the gas exponent of that scent, as well as, the emission of the gas or liquid from the body. This science course instructs the science of scent from an environmental aspect. It teaches the specifics of what scent’s are, where they come from, and how the science of nature affects them. The course carefully maps the components of scent and the physical chemistry, wave dynamics, thermo physics, and biology, to layer a picture of scent and it’s behavior under specific circumstances. This class follows Canine Olfactory Neurobiology. This course teaches the olfactory neurobiology process from the review of the nasal and odorant sensory neuron to the olfactory bulb: The course teaches the olfactory neurotransmission as it prepares to regulate biological responses and carries out the process through specific pathways, canvasing many neurological nuclei. The student will learn the resolution of neurological olfactory stimulation throughout the brain and behavioral memory. This science course explains the physical laws that regulate how gasses react under specified conditions. The course uses chemistry, biology and physics to teach the calculations and natural recognition of the behavior. The molecular weights and distribution conversion rates are also instructed. This course follows the fundamental neurobiology course and is the prerequisite to Behavioral Neurobiology II. The program instructs the student in the basic function on the cellular levels of synaptic function, receptors, and neurotransmitters. The course teaches an advanced level of autonomic nervous system reactions: parasympathetic and sympathetic systems. The olfactory to sensory behavioral load is also covered in depth. This course instructs students on the behavioral function of the endocrine system of both the human and the canine. The course offers a clear insight into the biological events that transpire during the primary functionality of life: rest and stress. The course explores the functions of the endocrine system, triggers and modulators, affect on the motor cortex, effect on the limbic system, effect on memory. This course teaches the technical aspects of narcotic odorants. The course breaks down the organic chemistry of narcotics, establishing the specific odorant composition, as well as, the multi chemical basis for the final resultant odor. Following, the course teaches the individual behaviors of the states odorant components and the over all achievement of the gas behavior. Gas behavior for environment, vehicle, and building are all discussed at length. This graduate class reviews the canine olfactory system in its’ entirety and then instructs the student in the chemistry of neurological, olfactory sensory neuron synaptic potentiation, as set forth by chemoreceptors and the chemical gases they receive. A focus point is made on the genetic structure of the OSN and the receptor protein formation, as well as the dimer principles of chemoreceptor function. This course concentrates the student’s attention to the precise chemical analysis for human scent composition. The Volatile Organic Compounds, which play the essential role in communication of olfactory detection, are explored, as they relate to human composition and gasses that emit from the sources. This science course follows behavioral neurobiology I. The program instructs students in the concepts of depolarization of neurons, potentiation, synaptic structure, amygdalae nuclei and the respective function of fear, hippocampal nuclei and the support of memory storage, and the direct function of adrenaline, dopamine, serotonin, and glutamate. The student will be clearly driven by challenges of visual content and research of topics. 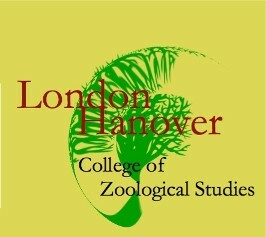 The London Hanover University School of Veterinary Sciences instructs this class. The class exposes the student to the biological anatomy of the canine species, including: neurology, endocrinology, vascular, skeletal, and more. The primary focuses are on the structure of the head and the respiratory tract. This class follows Behavioral Endocrinology I. This course teaches the student the primary function of neuroendocrinology and the specific effects of the endocrine system on the behavioral nuclei of the thalamus and pituitary glands. A strong focus is placed on the neuroendocrine integration and the effect the integration plays in memory aesthetics, learned behaviors, motor operators, and drives. The London Hanover School of Medicine teaches this course, through the department of neurobiology and anatomy. This course explores and defines the canine Neuroanatomy. The course is divided into three core platforms: motor system, sensory, and limbic. This course concentrates on the specific chemical properties, emitting odorants, found within explosives and explosives components. The focus is placed on the chemical picture of the explosive, as an odorant for a microsmatic species. The volatile organic compounds and inorganic compounds will be reviewed, as is the chemical engineering of the explosives. This course does not teach a student how to make explosives. 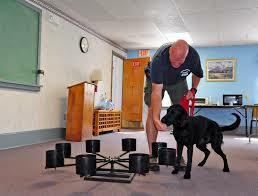 The course engages the student in the evaluation and exploration of explosives gasses, as an odorant a canine receives.